And every time I’m on a cleaning spree, (Today I’m going through old magazines – I have a collection. Smh.) 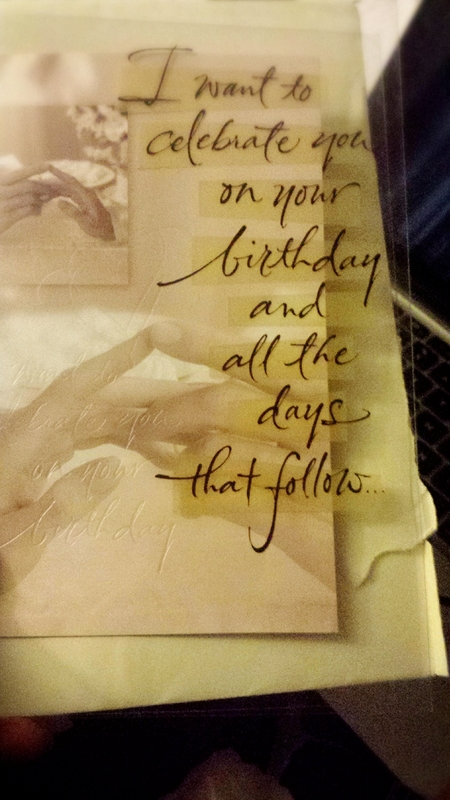 I find cards from him (birthday, mother’s day, etc.). At the time, I didn’t appreciate them because I felt like his actions weren’t consistent with the words on the cards. Kinda like “You wanna celebrate with me? So get up and make plans, dammit! Take me out.” Yadda yadda. Well he loved me deeply, but not in the way I wanted him to express… Someone advised me recently that he was content with himself, so he had no need to be in a constant state of “doing.” He was happy just “being.” I can see that, although I still believe that complacency has no place in a thriving relationship. At least try to find a happy medium. Like all of my exes, he came bearing gifts. The gift of stability and unconditional love. And oh lord, was he patient. He helped me with my children more than anyone else has in my entire life. But I stopped focusing on the very best in him after a while. (I was lonely and in need of “companionship.”) Mistake! Looking back, he had things going on that I couldn’t understand or empathize with, and he was unwilling to budge. Even still – not only should we expect the best from our partners, we should focus on and savor the best. And that is what we will get. No one will ever live up to the “partner vision” we have in our heads, but we can still have amazing! Focus on the best. Write a list every day if you need to. Cheers. Complacency is a relationship killer. Don’t I know it. Leaves you wanting to literally shake somebody. And it was driving me crazy. Thanks for chiming in.